If you have recently chosen to start your own online store, you might be overwhelmed with the amount of effort you need to put into social media in order to grow your business. However, putting in the effort now can pay off in the long run when you boost sales through a fast-growing social media network. It’s important not to waste the often over-stretched resources of a small business, so knowing what Instagram is and how it’s used in order to decide whether it’s right for your business is a must. Instagram is a social media network focused on visual images. 60 Million Photos shared every day. There are no status updates or 140 character limits, and instead the entire update is one square image (and an optional caption). Users ‘follow’ other users that they are interested in, and can then scroll through image after image on their newsfeed. Ideally, you should caption the images that you post on Instagram to give your followers context, such as ‘New product ready to roll out in Autumn 2014! #fashion #handmade’. The caption helps users understand what they’re looking at, while the hashtags make your post searchable for anyone who is interested in that category. For example, users interested in #PlusSizeFashion can look at only images that contain this hashtag -- if you use it, you’ll show up with thousands of other plus-sized designers and fashion bloggers. While it was launched in just 2010, Instagram now has around 200 million monthly active users. Using Instagram can allow you to show a more casual side of your business -- your products in use, the process of manufacturing them, the pile of boxes to be shipped out during Christmas shopping rush -- and build your brand through a visual story. Posting images of your products to Instagram, along with product details and information on how to purchase the product, automatically turns any user that sees it into a window shopper. If they’re interested, they can easily click to see all the images you’ve posted, continuing to window shop and increasing the likelihood that they’ll end up placing items into their shopping cart. 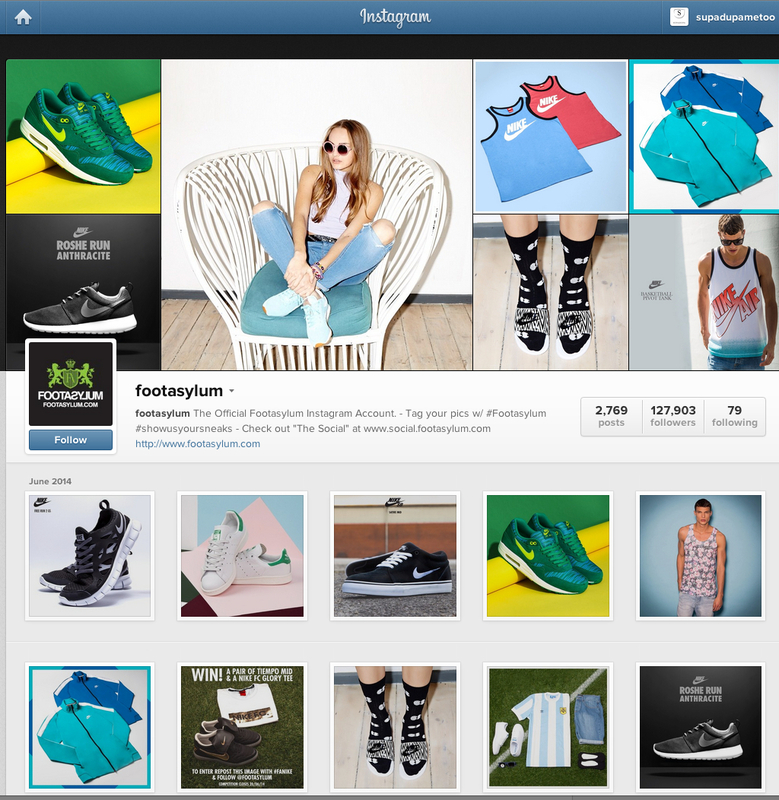 Example of a great Instagram profile by Footasylum a fashion based retail store. Instagram isn’t just for pictures of your products. Take pictures of your employees, take selfies at industry events, and capture all of the most exciting moments in the life of your growing online boutique. Talk about what’s happening in each picture in the captions, so that your followers can stay updated on your business. This ensures that your online shop stays in users’ minds. Most people love being able to peer behind the curtain into the inner workings of a brand. Give users behind-the-scenes updates on what really goes on at your company: is it just you and your partner, hand making handbags from your apartment with your grandmother’s sewing machine? Or do you have a staff of quirky employees who are goofing off on the job? Any of these things can be Instagrammable moments. Show people the individual components that make up your product, so they can see the time and effort required to bring them the final product. Your Instagram account doesn’t have to just be pictures of your staff and your products. You can share inspirational quotes that you feel reflect your business’s philosophy or even promote giveaways to your users. Use an app like Instaquote to easily turn details of your giveaway into an Instagram-ready format. If you have your account set to automatically post to Facebook, this can be a boon for your business as most brands find that images get shared more than plain text updates about a giveaway. 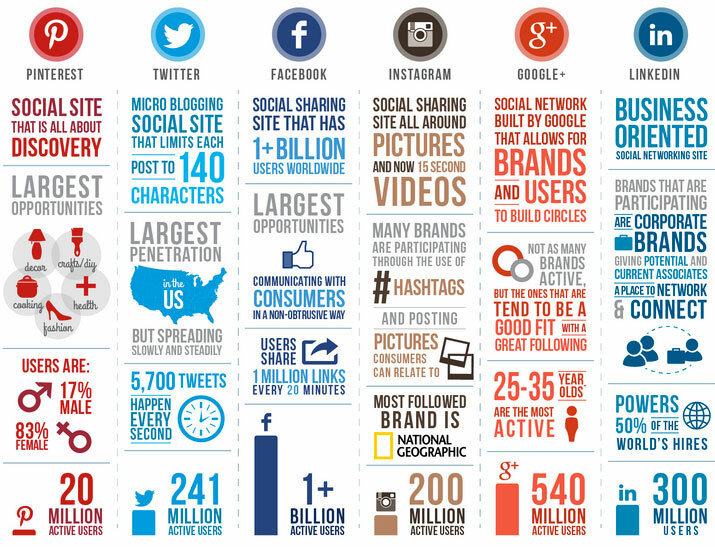 Social Media Comparison Infographic by Leverage New Age Media. It’s important to remember that Instagram might not be worth the effort for every business. For instance, it’s only the 6th largest social media site, trailing far behind networks like Facebook, Twitter, Pinterest. If you have limited time to devote to social media marketing, you’ll have access to more users with the Big Three of social media, and Tumblr. Instagram is also a largely mobile-based social media network, with most users perusing through photos via a smartphone app. This means the demographic tends to skew young, making Instagram the perfect choice for a custom skateboard shop but perhaps less useful for a medical supply retailer. You’ll have to consider your own customer demographic in order to figure out if Instagram is worth the effort. However, effort can be reduced by linking your online store’s Instagram account to Facebook and Twitter so that any images you post are automatically posted to your other social media accounts. With this in mind, one could make the argument that Instagram is very little effort for the exposure it offers. You can easily see which images get the most attention on Instagram and get inspiration from people who are using Instagram effectively. Don’t just post pictures -- follow other users with similar interests, and search hashtags that are relevant to your business to see what others in your field are posting. ‘Like’ photos by clicking the symbol of a heart in the bottom right corner, comment on popular posts, and follow everyone of interest to get engaged with users and brands in your industry. Top Instagram users have curated their accounts so that all of their posts are visually appealing, funny, or in some way useful to users. Don’t be afraid to post many pictures to your Instagram, but make sure that everything you post makes sense with your brand and is something that you would want to see on your own feed. Only post your best pictures, and don’t be afraid of using Instagram filters - that’s what makes users flock to Instagram in the first place! Spread out your updates throughout the day, and remember that uploading 10 photos at once may come across as ‘spamming’ your followers’ news feeds. It bears repeating: hashtags ensure that your photos come up when people do a search for that hashtag. Tag all of your handmade jewelry #handmade, #custom, #smallbusiness, #madewithlove, #accessories -- anything that makes sense. Don’t forget location tags! People in London might want to see what’s happening in their city, so using #London or the appropriate hashtag for wherever you are can really boost your views. A social media platform allowing you to post text, photos, quotes, links, music, and videos from your device. A website which aims to maximize the impact of your business, brand, social media strategy, mobile app, or marketing campaign. A helpful website providing statistics on Instagram. A website to help find the best hashtags for your posts. A website providing quotes and text to images or backgrounds for iPhones and Androids. A website showing how to display multiple images in one post by making a collage for both iPhones and Androids.